In 2010, the MRWA Education Committee decided on natural shoreline education for one of their focus areas. Four Committee members and one staff person were trained by the Michigan Natural Shoreline Partnership Train-the-Trainers program in spring 2011. 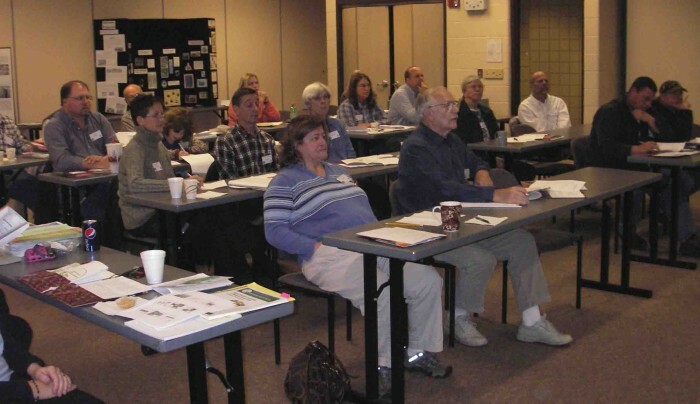 The Education Committee’s first workshop was held on November 5, 2011 at NCRESA in Fremont (Newaygo County). Nine homeowners and six landscapers participated in the day-long program. In addition to the workshop materials, property owners received a coupon worth $20 for native plants at one of the county Conservation District sales. Landscapers received Natural Shoreline books and were entered into a drawing to attend a Certified Natural Shoreline Professional training session. Natural Landscapes: What’s usually done? What can be done? Who can do it? The following workshops were also held in the Muskegon River Watershed. If your lake or stream association would like to have a mini-workshop at one of your meetings, please contact Terry Stilson at mrwa@nullferris.edu or 231-591-2324.